The suede side of Twinface sheepskin is susceptible to staining and discoloration when exposed to moisture. To ensure longevity, use the UGG® Care Kit. Made to match mom's Lilou, the Lillian is sure to brighten up your little one's winter afternoon! 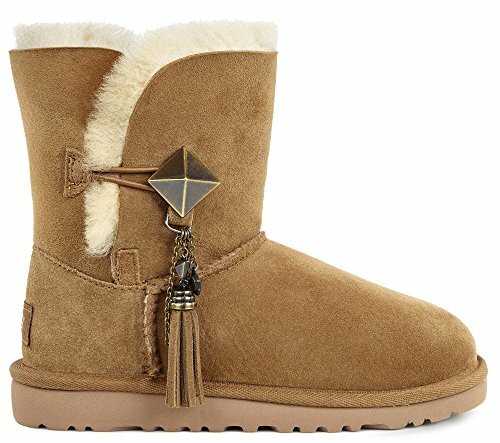 Twinface sheepskin upper features a a tassel-detailed metal button closure. UGGpure™ wool lining and insole. EVA outsole. Imported. Real sheep fur or lamb has been artificially dyed and treated. Fur origin: Australia, European Union or United States. Measurements: Weight: 10 oz Shaft: 6 in Product measurements were taken using size 2 Little Kid, width M. Please note that measurements may vary by size. The suede side of Twinface sheepskin is susceptible to staining and discoloration when exposed to moisture. To ensure longevity, use the UGG® Care Kit. Made to match mom's Lilou, the Lillian is sure to brighten up your little one's winter afternoon! Twinface sheepskin upper features a a tassel-detailed metal button closure. EVA outsole. Imported. Real sheep fur or lamb has been artificially dyed and treated. Fur origin: Australia, European Union or United States. Measurements: Weight: 10 oz Shaft: 6 in Product measurements were taken using size 2 Little Kid, width M. Please note that measurements may vary by size. View More In Rain Boots.